The Latvian Semi-Final was held on February 19th at the LTV Studios in Riga, hosted by Ketija enberga & Toms Grevin. Before the semi-final there were two quarter-finals - click here for details: LATVIAN QUARTER-FINALS 2017 Four songs in the semi-final qualified for the final - 2 chosen by an "expert" jury and 2 chosen by televoting/online voting/spotify listens. The column of results shows the placings from the televoting/online voting/spotify listens. The "expert" jury had the same top 4 as the televoting/online voting/spotify listens. 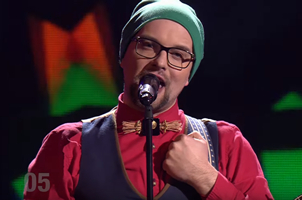 Lauris Valters represented Latvia in ESC 2013 in the group 'PeR'.